Classic. All-American. Quintessentially Summer. 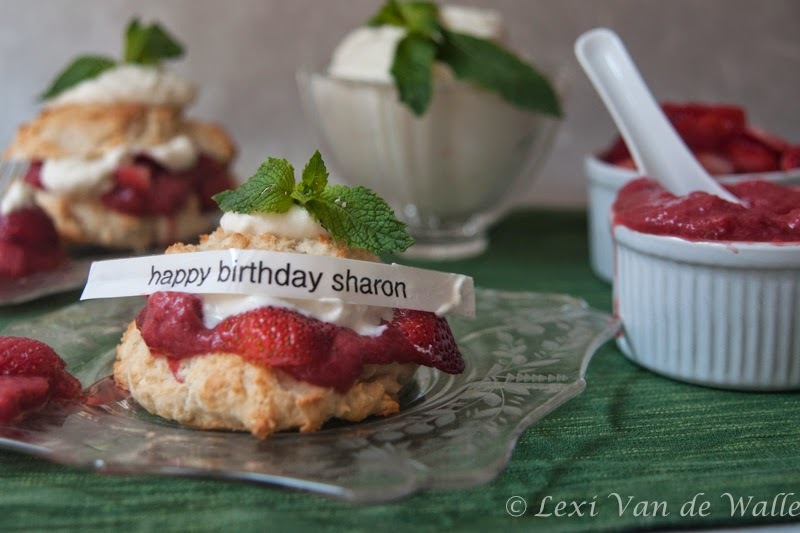 Strawberry Shortcake is the ultimate in easy desserts. 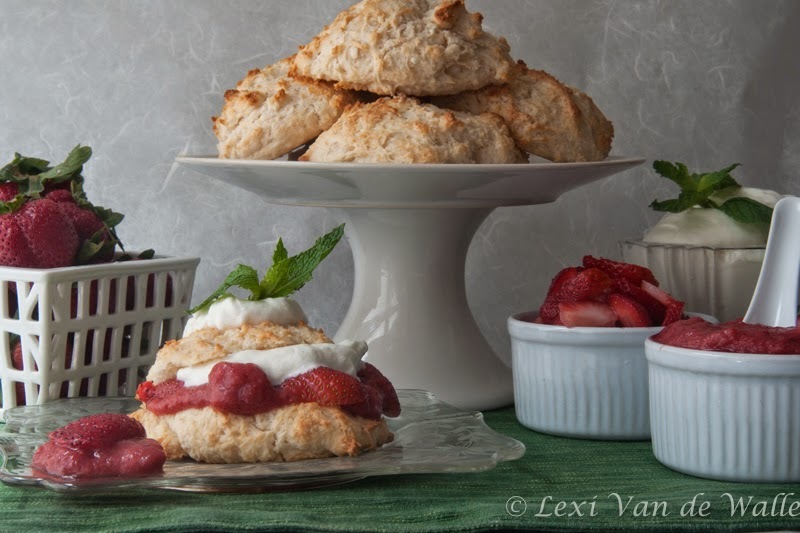 Out-of-the-oven shortcakes, a kind of sweet biscuit, slathered in juicy, delicately sugared strawberries and topped with heavenly whipped cream. Super easy. 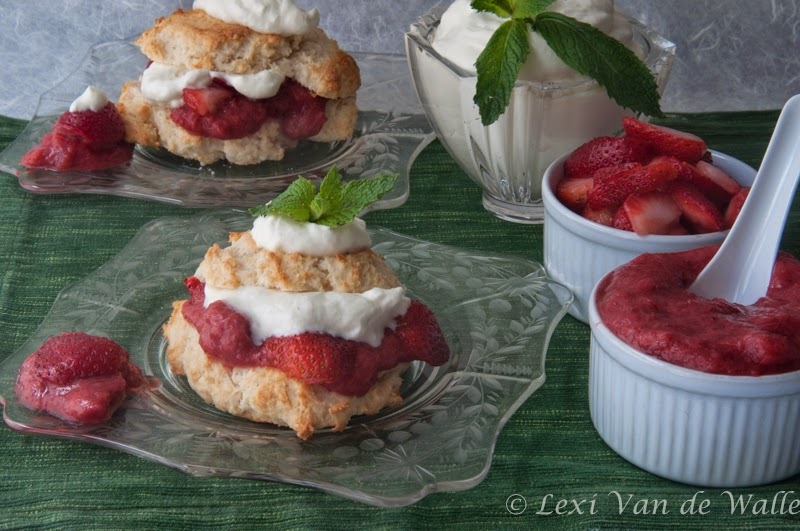 With a tad more effort, you can take old fashioned and delicious up a notch with this Strawberry Rhubarb Shortcake topped with Mint Whipped Cream recipe. The tartness of the rhubarb and refreshing mint-infused whipped cream make for a sophisticated dessert full of tasty surprises -- fresh, creamy, flaky, sweet, tart, herbaceous. Wow! I’ve tried all kinds of shortcake and angel food type strawberry cakes over the years, but when I make homemade strawberry shortcake for family and guests I keep coming back to the Betty Crocker’s Bisquick Shortcake Recipe that my mother used to make in the 1960s — the one back of the box. Best served hot, you can prepare the shortcake dough for either rolled and cut or drop biscuits — made of Bisquick, milk, butter and sugar — ahead of time and pop them in the oven at the last minute. The strawberry rhubarb compote, fresh sliced strawberries, and homemade mint syrup for the cream, can all be prepared up to one day ahead. While the shortcakes are baking make the whipped cream. Assembly: Using a serrated bread knife, carefully cut a warm shortcake in half. Spoon 1/3 of a cup of strawberry rhubarb compote onto the bottom half of the cut shortcake, then add a layer of fresh cut strawberries. Top with a few tablespoons of whipped cream. Place the other half of the shortcake on top of the mint whipped cream and add another dollop of whipped cream to the top of the dessert. Garnish the plate with a mint leaf, teaspoon of compote and a sliced strawberry, if desired. Made with a fraction of the sugar of a typical rhubarb compote, this recipe results in a tart not sweet jam. Additional sugar can be added if desired, up to one cup, for a super sweet concoction. In a large saucepan, add water and sugar first, then add the rhubarb and cook over medium-high heat until the rhubarb begins to soften, stirring frequently. About 5-7 minutes. 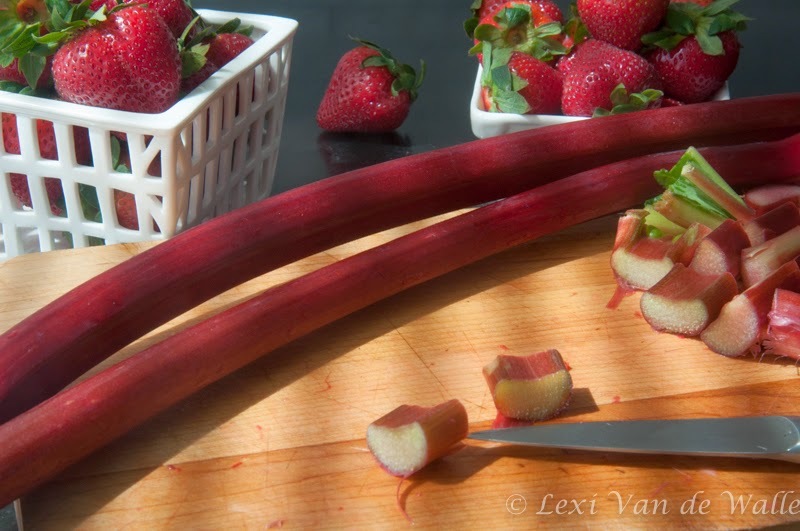 When the rhubarb is soft, add the strawberries, stir, and continue to cook for another 2-3 minutes until the berries begin to breakdown into a jam-like texture. Remove from heat and set aside. If making a day ahead, the compote can be refrigerated in a covered container. Serve at room temperature. In a medium saucepan, bring sugar and water to a boil over a medium flame. In the meantime, wash, trim and coarsely chop the mints leaves to release the flavorful oils. Add mint to the sugar and water mixture, reduce heat to low and cook, stirring frequently, until the leaves are wilted (about 5 minutes). Let steep another 10 minutes and strain mint syrup through a fine mesh strainer. Press on the leaves with the back of a spoon to get all of the good stuff. Toss leaves and reserve sugar. Reserve in a covered container until needed to make the mint whipped cream (recipe below). 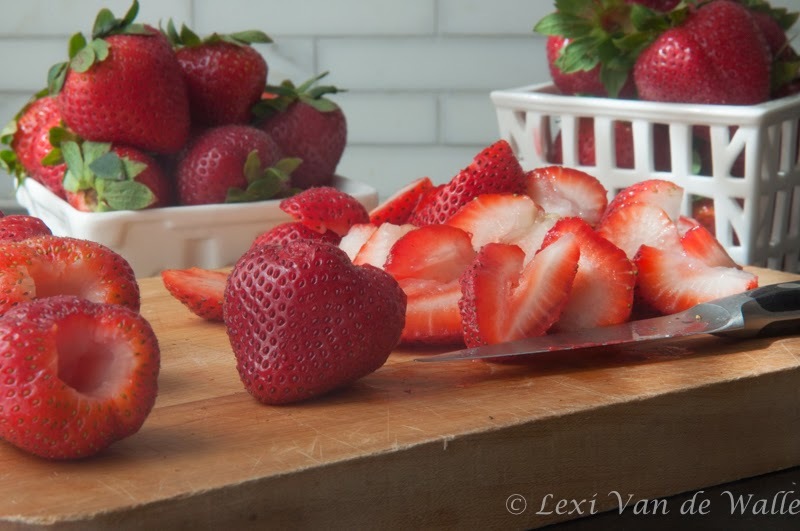 Slice strawberries and sprinkle sugar over the top and set aside in a covered container at room temperature until ready to serve. If prepared in advance, refrigerate. Remove an hour before serving so the berries are at room temperature. Betty Crocker Recipe is online here. In a chilled metal bowl, add heavy cream and mint syrup. Using an electric beater or large balloon whisk, whip cream on high speed until stiff peaks begin to form. As with any recipe, use the highest quality ingredients that you can find. I prefer Driscoll’s brand strawberries, which is a premium brand at finer grocery stores, or local berries from the farm stand in June. Rhubarb has a very short season during the late spring months in New York - buy extra and freeze. 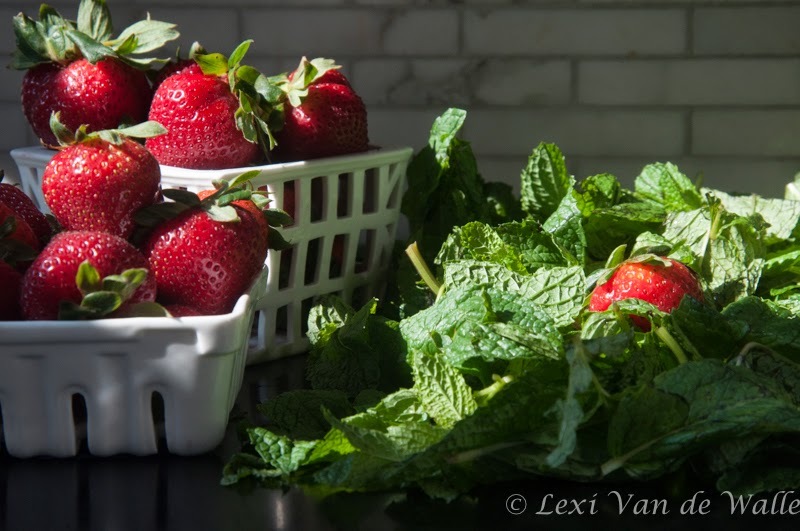 Fresh mint should be bright green and super fresh for the best presentation and taste (minimize any browned leaves). And, there’s nothing like local heavy cream that has NOT been ultra pasteurized for creamy flavor and stiff peaks.